With Gottacon, the ultimate gamer’s convention, about to happen this coming weekend, every gamer may well stick with what the Fairmont Empress has to offer (at the Ivy Ballroom) or dine out just for a change of scenery. 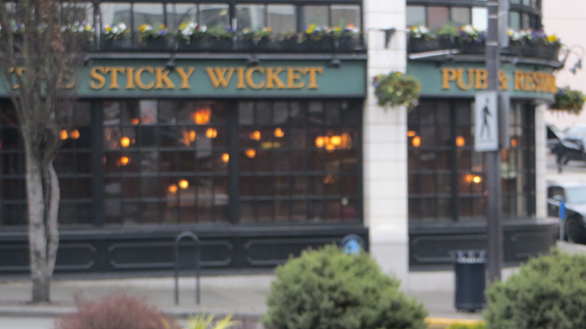 If what the hotel is selling seems limited, presented here is part two of the guide to the local eateries within a one block walking distance from the Victoria Conference Centre that the Two Hungry Blokes have sought out for the discriminating eater. E: The treats here will keep anyone on a caffininated sugar high. Yes, if you know what to look for in this shoppe, anyone can rocket off to the moon in no time flat during those long nights. J: The English Sweet Shop has been a Victoria tradition since 1910 but sadly I feel this business model is somewhat outdated. Don’t get me wrong; I’m very protective of this establishment but they are being undercut in price by Fairway Market. Since there is no Fairway in the immediate vicinity you may have to visit English Sweet Shop for your British treats — or you could walk over to Johnson Street to Oh Sugar. They may have a smaller selection of British treats but they have a larger international one. 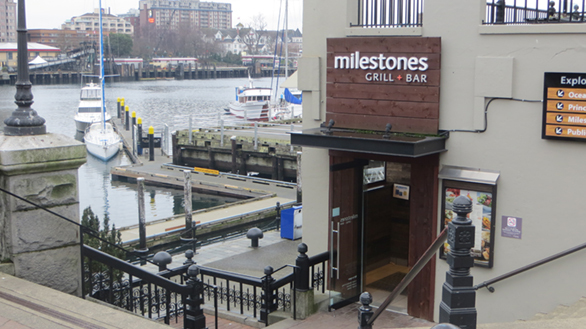 E: Milestones is a very pricey restaurant, and you can expect to be in here for at least 90 minutes. It’s a slow place to kick back with a bunch of friends and enjoy the view ot sunset over the Inner Harbour. But for mad gamers in a rush this is not a good place to get a protein fix. I’ve been here once, and they messed up my order big time. I wanted a rare steak and got medium. J: As Ed said, it is pricey. If you have holiday (vacation for you non-Brits) funds to burn, you can do so here. 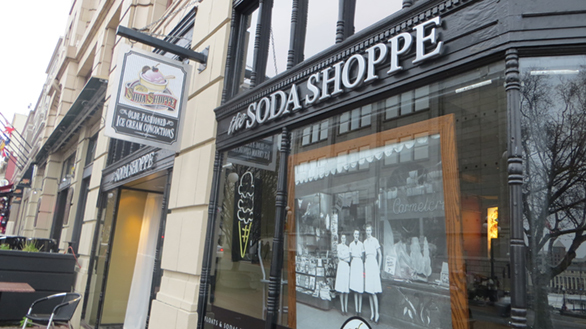 E: The Soda Shoppe makes the best cherry Coke hands down. When I really want to treat myself, what they serve is great and I’m only sad there is only a one size fits all cup. Their sugary treats are sweet, but I’m only here for a spritz of their drinks. J: It is a tourist trap but it is not one I mind being trapped in. Rogers’ Chocolates used to own this place until about March, 2010 when it was bought out by a former employee. This place has so much potential but on my last visit, they had yet to reach that potential. If you’re a new customer, standing in a line-up to order ice cream only to be redirected to another line-up around the back is frustrating as hell. 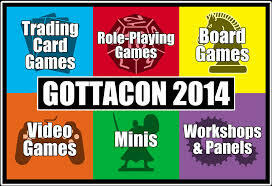 But since GottaCon gamers will be visiting the city in our off-season for tourists, the line-ups will be more tolerable. E: I’ve been to Sam’s Deli a fair number of times to say that its the best place for a lunch. Everything is made fresh to dine-in or on the go. Readers can find a full review here. 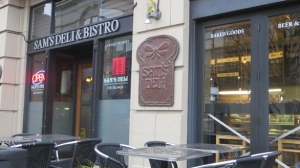 J: If you work right in the heart of downtown, no day goes by without a delicious bite at Sam’s Deli. From delicious soups to sandwiches, Sam’s has been the heartbeat of Victoria for over 40 years. E: Unless you’re part of the social elite, Brown’s Social House is definitely not for the layman or gamer. Honestly, there is nothing spectacular about this place in the one visit I made. I’d rather walk up the street to Fatburger if my craving is for a decent hamburger. Fancy digs and overpriced meals do not make for a good start unless you happen to be working for the Government of British Columbia. 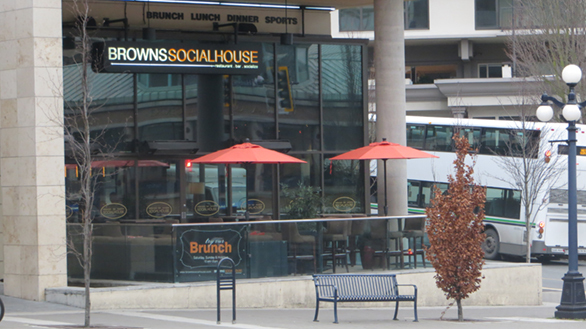 J: Brown’s Social House is more for the middle class than the common worker. But Victoria it appears has a fairly large middle-class population. A new Browns is under construction in Langford. E: Uh, James, just what is your definition of middle class? Don’t you mean Upper Middle Class? E: Uchida is hands down my most favourite place to visit when I’m in this neighborhood. 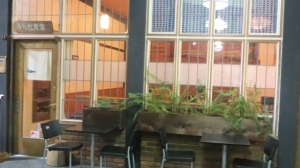 Tucked inside Nootka Court, I can get a bite for less than $10 and be filled. They even offer rice-balls! I can take some of them to go and nibble away at them during a movie at Vic Theatre (in the afternoons) or stay here to enjoy their gentle miso broth. J: I agree with Ed on his observations, Uchida is a great place for a bite if you are in the mood for Japanese fusion. But I am at a loss when Ed says it fills him up. Uchida is very high quality but if I want more food ranging from average to above average quality, I walk over to Sushi Plus on Yates Street next to the Odeon Theatre. E: The Sticky is a staple of the Victoria nightlife scene and it’s through-n-through a bar. It’s definitely a watering hole for many a downtown denizen but when I’m living in the suburbs, I don’t feel quite at home here. I’d rather hang out at the Rooftop Surf Club. I’d say this place is definitely worth heading to when with a good group. By yourself, that’s just another matter.J: They have some cozy booths in the Wicket, just perfect for snuggling up to that special someone you just hit it off with at the con. But of course that comes secondary to the gaming, right? This entry was posted in Annual Events, Food and tagged GottaCon. Bookmark the permalink.